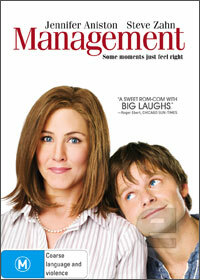 Starring Jennifer Aniston and Steve Zahn, Management is a pretentious romantic comedy about one very unlikeable woman, Sue (Aniston) who has trouble finding any jobs in her life and an almost special man called Mike which is bordering on another stereotypical performance for Zahn. This is a shame because Zahn was simply brilliant in The Perfect Getaway. In the movie, Zahn is lonely middle aged man working at his parent's Motel who is captivated by one of his guests, Sue and through his persistence, they both end up having a fling. As Sue moves on, Mike cannot get this travelling art saleswoman out of his head and eventually stalks her to a secluded country town, only to find out that she has moved in again with her ex-boyfriend Jango (Woody Harrelson) who happened to a punk rocker. As Mike attempts to woo Sue back to him, Jango has other ideas and thus begins a game of courtship which sounds great on paper but fails to deliver on film. Unfortunately the comedy of this movie falls flat, although I must admit that Al (James Hiroyuki Liao) had some great scenes in the movie who plays Mike's friend and "boss" at the Chinese restaurant where he works. For a romantic comedy, it's actually not that predictable, however for laughs, it borders on not very funny at all. To compound the situation, Aniston plays quite an unlikeable lead character and both Zahn and Harrelson are stereotyped once again. Although I do commend Aniston for playing this role because that's exactly that her character was suppose to be, unfortunately the script didn't work too well. Needless to say, the Management fails to give a thoroughly entertaining experience which is a shame, considering the calibre of stars in the movie! Next time, Hollywood needs to try a little harder!